House Call Pest Control is a full service pest control company offering service throughout Louisiana and the Mississippi Gulf Coast. House Call performs liquid soil treatments on all types of structures, including pre-treatments, preventing and eliminating termites that are entering from the ground. We offer quarterly residential pest control and monthly commercial pest control. This service covers the eliminations of roaches, rats, mice, silverfish and various other pests infesting structures. 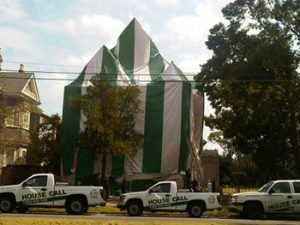 House Call Pest Control is the largest tent fumigation in the south completing hundreds of fumigations every year for the elimination of termites, beetles and bed bugs. Wood Destroying Insect Reports and be conducted and delivered as little as 24 hours after request has been made. All work preformed by House Call Pest Control is guaranteed, bonded and insured. Fill out the form below to schedule a termite and pest free estimate.